Homemade fudge is a delicious treat. However, on occasion rather that the smooth creamy texture you were hoping for it turns out grainy. This is a guide about preventing grainy fudge. Before putting ingredients in pan, butter the sides of pan or spray with Pam. When your fudge starts to boil, cover pan with lid for a couple of minutes and then remove. I also wash sugar from the spoon you first stirred with. 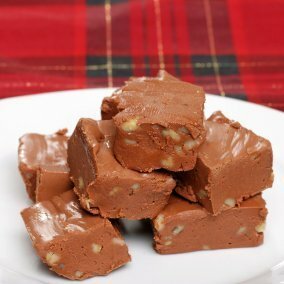 I have made fudge for many years and it is never grainy. I hope this helps. I too was taught to "not stir" my fudge after it begins to boil. For some reason, it makes it grainy. I've never put a lid on it but I assume this is a good way to keep one from stirring. :) I'll try using a lid to see if it makes a difference. Thanks for the tip! I make fudge for a living. What I do is melt cooking chocolate buttons or block chocolate in a double boiler with water underneath (take 500 grams of chocolate to 1 can sweetened condensed milk). Melt the chocolate first, then take it off the stove and pour in the can of condensed milk. Don't panic if it starts to thicken too much, just put it back over the heat and beat it as fast as you can with a wooden spoon. It will start to shine. Pour into a tray lined with baking paper (all the way over the sides) while holding it tight with wooden clothes pegs. No more grainy fudge. Just a Quick Tip: Don't have the water too close to the top of the boiler, and don't have the water too hot, just a rolling simmer. I have always heard that stirring the sides of the pan makes for grainy fudge too. After I heard this tip, I never had a problem. The best way I've found to prevent fudge from turning gritty (a direct result of the recrystallization of sugar) is to add 1/2 teaspoon cream of tartar for every 2.5 pounds of sugar used. Cream of tartar actually inhibits the sugar recrystallization process. Follow all other instructions for the recipe. Add a cap of vanilla extract if you notice an odd aftertaste (not everybody is able to taste the cream of tartar). Source: The French have been using this solution for ages to prevent the sugar from recrystallizing in fondant recipes. I tried it on fudge and it worked wonderfully. When making fudge, add 1/4 cup of clear Karo syrup to the ingredients. This stabilizes the fudge and it will not be gritty or chewy. I have read many of the posts, but have a few questions. Mine seems fine until I remove it from the heat and add the chocolate chips. Suddenly it becomes sandy/gritty and I have to try and save it. This happened even with adding cream of tartar right before removing from heat. Am I adding the tartar too late? And should I not be stirring it constantly from the get-go? I detest too smooth/soft fudge, so I use only cocoa recipe because I like it best, then fantasy fudge for peanut butter flavor. On the boil over problem, I lay the wooden spoon across the top of the pan.